Dorchester ‹ Series 9 ‹ Flog It! Paul Martin is joined by experts Mark Stacey and David Fletcher in Dorchester. Mark examines some trench art from World War I and David looks at a 19th-century pistol. Browse content similar to Dorchester. Check below for episodes and series from the same categories and more! and collectables brought along to our Dorchester venue today. We'll be taking the best items off to auction later on in the show. listed buildings, more than any other street in Britain. I just hope our experts are having such a variety back over at the Dorford Centre. and our team of experts are already hard at work valuing the crowd's antiques and collectables. and Mark Stacey, both of whom work as independent antique valuers. Antiques run in David's blood. In fact, his first ever job was working in an auction house, and he's been hooked ever since. He's very fortunate that he absolutely loves his job. By contrast, Mark first started work in the care profession and came to antiques a little later on. He began his foray into the business as a dealer and later went on to work for various auction houses. You might need this as an umbrella! unearth the hidden stories behind people's possessions. -16 pints of ale a day. -Well, I don't like them, anyway. No. But before all of that, David Fletcher is having a look at Lorna's collection of silver spoons. -Soon be time for tea. -Actually, I think they're probably coffee spoons. I thought they were, yes. and they were made to commemorate the Battle of the Somme. And each one of the bowls of these spoons bears the name of an action during the Battle of the Somme. as it would be on a piece of English silver. -And these tiny, tiny marks on the top right-hand side of each bowl tell us that. -which tells us who the maker is, but I haven't been able to distinguish that. and are enamelled with the flags of the Allies. -And can you trace them back to the Battle of the Somme? was a Queen Alexander nurse and she actually was nursing in the front. But she gave them to me as a wedding present in 1951. -And how did she acquire them? from the field hospital, she went off to local places and picked them all up. the time when they first saw the light of day. As a wedding present, you must be a bit sad to see them go. Yes, I am. I like them, but I've got to downsize. You've got to move on, as they say, haven't you? -appreciates their social significance. So that will be good, I think. As far as the value is concerned, they're affordable, really. I think, optimistically, we could expect them to make £10 a spoon. and, all other things being equal, would suggest a reserve of £30. and I look forward to seeing you at the sale. With a history like that, we shouldn't have any problem finding a new home for Lorna's silver spoons. before we take them off to auction. Hello. That looks interesting. Is that Keswick or Newlyn? -Yes, you can see the stamp. So, what's the story behind this? Are you a big Arts and Crafts fan? Yes, I'm really into Arts and Crafts. and I've had them at home, using them ever since. so we're looking to remodel the house! So this is one of the things I'd like to try and sell. That's the name of the game! That's why you're here to flog it, I guess. Good luck, hopefully we'll see you later on. who've brought in two Toby jugs. or "Toby character jugs", but where did they come from? Well, my mum bought this one many years ago. I think I was nine or ten. so I decided to buy Mum the small one for a Christmas box one year. So you found another one that matched in with that? And I think I paid about ten shillings and sixpence for it. Gosh, that's quite a lot, actually. That's quite a lot. -Is it about that much? -Ten shillings, that's 50p. Yeah, 55p. really are 18th century pieces. by firms like Ralph Wood. who literally drank 16 pints of ale a day. gin, ale - than it was to drink water. -whereas gin was for the working people. Reversed completely now, of course. But the interesting thing about these is they're not 18th century. -They're not that old. They're about 60 years old, I suppose. recognise that these have got the mark of Clarice Cliff on the back. Now, I'm not sure that they had very much to do with Clarice Cliff. I mean, the colours are quite bright, and they're quite vibrant. I suspect they were probably made just after the war. And this is actually a jug, of course. the same mark would have come from a little tea set. and you would have had a little creamer and a teapot to go with it. what do you think your ten shillings is worth today? or have you decided, "Well, we don't like them"? -Well, I don't like them, anyway. I'm not bothered, actually, whether they sell or not. I think you've got to be realistic. They're a little bit of fun. of £40 to £60 for the pair. What about reserve? Are you just happy to have them sold? -We'll just let them go. -Have a bit of fun on the day. because they are marked and they're sizeable pieces. We might have a pint afterwards! Might not be good to drive home after several large gins. at that fabulous Keswick tray belonging to Andrew? but he's far more interested in Andrew's copperware plate. Well, I think it's Arts and Crafts from around 1900, 1910.
and apparently they were a Birmingham company of that period. I would absolutely agree with the dating. which was to do with geometric shapes and geometric lines. than the true Arts and Crafts workshops at the same time. of what good Arts and Crafts copperware should be like. it's not something that was just stamped out by the thousand. if you like, and it's a stylish piece. Was it always made to hang? I assume that's original. I think that's exactly right. Yeah, that is original. Tell me what you think it depicts. Well, I think it's a winter scene. -and you've got the bare trees in the background. each one representing a different season. -So, are you going to miss it? and this and the tray as well have to go, I'm afraid. Right, so, what's it worth? -I would suggest an estimate of £50 to £80. You don't look exactly thrilled by that. -No, that's a bit less than I was hoping for. -and that was £300 for the two. A substantial part of that. in the last few years anyway. -This was ten years ago. and agree to a reserve of £45, I'd be delighted. -Jolly good. OK, Andrew, £45 fixed reserve, estimate 50 to 80. I'll see you at the sale. Well, I think it's about time we upped the tempo, don't you? but we're going to put our experts' valuations to the test right now. There's a few cracking ones there and hopefully one or two surprises. of the items going under the hammer. for Lorna's collection of silver coffee spoons. but will we be able to find a bidder to take them off her hands? is going under the hammer. Let's hope we can get him a good return. and auctioneer Matthew Denny is on the rostrum. Lorna, good luck. We've got our fingers crossed. This is Lorna's first auction. We're about to sell the silver coffee spoons. -There's a lot of silver here today. a significant battle, and significant things. Good luck, then. Here we go. World War One period commemorative spoons. I've got commission bids at £30 to start, I'll take 5. At 35. 40. 5. 50. 5. Take 60 next. At £70 on the side. I'll take 5. At £70. 5, if you like. On my left at 70. 5 anywhere? Yes, £70! That was short and sweet, wasn't it? Blink and you'll miss that one! £70. Are you happy? because I thought originally they weren't valued that much. No, I thought they would, so I'm thrilled. I'm glad you're pleased too, Lorna. and that's the beauty of auctions, really. Lorna's spoons have got us off to a really good start. They went for well over the estimate. and Gary Batt is on the rostrum. Serving up right now we've got an Art Nouveau copper plate. It belongs to Andrew, with a valuation of £50 to £80 on this. -because it's very affordable and looks good. something like this will get you going. As you say, 50 or 60 quid, really, it's not a lot. It's nothing. It's absolutely nothing, no. And I think that's what this saleroom's built on, really. Rather nice Arts and Crafts wall plate, a cloaked woman. -Landscape, quite a stylish piece. I've got overlapping bids at £30 to start. I'll take a fiver if I can. At 30. 5. Thank you. 45. 50. Yes, madam, 50. 50. Take a fiver from anywhere. Everybody finished? Clear at 50. Good. It's gone. Well done. -Thank you, Andrew. Thank you. Well, that one just scraped through. I think it was right on the money, though. as we see what those two Toby jugs go for. OK, we've got some Clarice Cliff going under the hammer. It's a pair of Toby jugs. That's quite unusual, I think. They're quite local, Paul, of course. -Right, OK. Well, I know they were your family's, weren't they, Michael? -Do you like these, Josephine? -You don't like Toby jugs? -I don't like Toby jugs. -But I'm sure somebody out there will love them. Well, I'm not sure how much Clarice Cliff had to do with these Toby jugs. -The printed backstamp could be put on anything by the factory. But they're certainly quite colourful. -Well, good luck, you two. Clarice Cliff Toby jug. And another. Here we are, two Toby jugs. Very decorative. I've got what for this lot? -At £30? 30 bid. 35, anyone like? 35. -Dubious. The bidders are dubious. We're out now. You're in at £75. 80? 80. Well done, sir. 5. At £120. Near me, against you at the back, then. Going at £120. Are we out and clear and sure I sell? -That turned out to be a very good combination. That was a brilliant result. Michael's Toby jugs doubled the top end of the estimate. are lucky enough to examine some collectables that just ooze history. used the spent cartridges and shells to make themselves practical things. proper engineer's toy, that, isn't it? ever since I was a young lad, and that's these buildings, lighthouses. lighthouses play in helping to keep our sailing vessels safe all around the British Isles. to help keep our navigators safe. The first lighthouse built by Trinity House was in 1609 in Lowestoft. Today, Trinity House has 69 working lighthouses, which have been automated since November 1998. North Foreland in Kent, was converted to automatic operation. Today, I've come to see this lighthouse on Portland Bill. There's been a lighthouse here ever since 1760. The one I'm looking around today was opened in 1906.
this is the fifth lighthouse to be built on the Bill. I'm thrilled to be getting a personal tour from Larry Walker. before it was automated, and he still keeps a watchful eye on it today. -Hi. Pleased to meet you! -I'm pleased to meet you, Paul. I'm looking forward to my tour. God, that's a strong handshake you've got! How long have you been the lighthouse keeper here in Portland Bill? On Portland Bill here, 32 years. -You must love the job. It's a vocation, not a job. -Have you worked in any other lighthouse? This is actually my 22nd lighthouse. Yeah. The last lighthouse before I came here was Eddystone Lighthouse. Plymouth Hoe. I've been up that. Did you know when you get to the top of that one, that one actually wobbles? -I don't like that. I really don't like that. Does this one wobble? -Well, I'm really excited to get up this one. -So, we'll start at the top. -Yes, we are going to start at the top, Paul, up in the lantern. But before we get there, you've got a long climb to go. -How many steps are there? And I'll bet you know every single one. -By a rude word, yes, I do. And 20 years ago, I was able to do it in 42 seconds from the base of the tower into the lantern. That's not bad going. Shall we try and beat it? Well, you can, but I'm not. Right. Well, this is obviously the main light, and I know that rolls on a bed of mercury, doesn't it? That's correct. This is technically what we call a mercury-float light-revolving system. It is doing one revolution every 20 seconds. of four lens panels, and there's one just coming round to you now, and one ginormous big reflector behind it. the character of Portland Bill lighthouse is four flashes every 20 seconds. Every lighthouse in the UK has its own distinctive character. There's no other lighthouse in the UK that's got the same character as Portland Bill lighthouse. How far away can that light be seen? On a good night, Paul, it should be in excess of 25 miles you'll see this light. -That's the beacon of hope. -it's got to be Portland Bill. -And then we're going home, yeah. It must be kind of a solitary life. a family station, so you would be here with your families. especially if they've got a nagging wife at home. That's not for the camera! Would you like to go and have a look on the gallery there and have a look around the gallery? I tell you what, it's not until you're up here you realise how high we are. -What height is it, anyway? -You're about just over a hundred feet here on the gallery, Paul. Look, that's choppy out there. -That's the Portland Race over there, and that's where two of the tides meet. It's fresh. Come on, then. Back in the warm, Larry takes me down one level, to the nerve centre of the lighthouse. This is the service room, Paul. The room below the lantern is always the service room. And this is where the lighthouse would probably be run from. In here, the keeper would have spent most of his watch-keeping. I was going to say, it's really the hub of the building. would have been, and he would come up here on the start of his watch. other than checking the light upstairs and checking the light near the base of the tower. We're heading all the way down now to ground level, to my favourite bit of the lighthouse. Here we have two fog-signal air compressors. -These compressors were actually used prior to 1995 to power the old air-type fog signal. Now, since 1996 and automation, we have an automatic fog signal, and it's a squeak. -And it's only meant to be heard about a mile to two and a half miles maximum. Can we hear the old sound? My tour wouldn't be complete without nostalgia. -OK. I've heard them before. Right, so what I suggest you do is go out to the west door there and wait for it to be put on. because I think this is the perfect ambience for listening to a foghorn. that nostalgic blast from the foghorn, so any second now... Let's just wait for it. no rest for our team of experts, who've been hard at work valuing the locals' antiques and collectables. memorabilia which was brought in by Barry and his wife Betty. You've brought in a fascinating little thing. ..then a story comes along which is both very, very sad and actually quite humorous at the same time. and they were presented with a nice scroll, which is in the box here, and that's one part of it. And that's worth anything from £50 or £60, I suppose. And here, somebody's turned what looks like a pair of boots into a pair of lighters. -..you know, which is absolutely charming. But having said that, we then have a letter. ..great-grandfather, of course, has been lost, he's had his letter. His wife, Mrs Symes, is heartbroken, writes to his commanding officer asking his whereabouts. telling the sad story of his death, which was accidental. -..having left his post to go looking for rabbits. But it doesn't say how many rabbits he caught. It could have been Dad's Army, couldn't it? Has it passed down the family? Er, yes! You could say that! -But I just love it. When you look at the consistent parts, you might say this is worth £50. Those are worth, you know... This is damaged. £20 or £30. collector, who would be in heaven to be able to tie all that together. And so what is it worth then? Is it £200? Is it £300? We honestly don't know. And you've saved it from the rubbish dump. It was going out with the rubbish, yeah. Can you imagine? That would have been terrible. 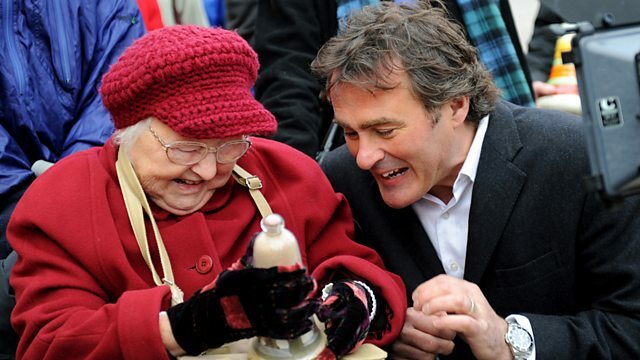 You know how enthusiastic I am and the team are here at "Flog It!" to have a bash at it, but we do understand the difficulties. It comes to a time where the decision is yours, as they say. -We can't take it with us, can we? So...! Would you like me to give it a try? Thank you. And I do think we'll protect it with a reserve. then you must protect it, and we'll talk after the sale and we might find something else to do with it. I think it would be lovely. Thank you so much. So Mark has put an estimate of £200 to £300 on Barry's collection of World War One memorabilia. We'll see how that estimate fares shortly. Next up, I'm wondering where everybody has gone! Don't worry, I'm not turning into a cameraman. to come back from lunch, because they have been working flat out. -Nigel. Pleased to meet you. -I was just wondering what you thought of that. That's nice. Is that meths-driven? -Cor, there's quite a weight to it. -the ones that I had when I was a little boy. -Yeah, the hot air rises, pushes the piston up, and that starts it going. -This one's not steam-driven, though. -No, it's not steam-driven, no. Isn't that lovely? And had you played with this as a young boy? I did. It must have been 50 years ago the last time I played with it. I always remember when I was younger, I was slightly disappointed when I was given it because it didn't move. It took me some time to get the mental adjustment that it was a stationary engine, not a moving one. Well, you were a young lad 50 years ago, and this was a very expensive toy then. ..and I think by his father as well. I'd put this around the early 1900s, wouldn't you? so that's got to date it about 95 years at least. It's beautiful, it really is. There was no way of controlling the speed, though, was there? Once this heated up, that was it. ..you had to remove the flame or turn the flame right down. Yeah. Do you know, I think everybody will go absolutely crazy for this. All the engineers in the auction room will, all the old boys that like tinkering with things. It's a nice thing to have and hold. And I'm quite surprised you want to sell this. Yeah, but this was your dad's. Don't you feel guilty? If this was my dad's, I'd never sell it. Well, I feel more guilty on the basis that it's never used, never run. around £80 to £120, maybe £150 if they're in good condition. I think this is far superior. It's much earlier. I think we could be in for a surprise, both of us, in the auction room on the day. Let's put it in with a cheeky £200 to £300 valuation. -OK? It's going to do that any day of the week. -But we'll put a fixed reserve of £200. And hopefully the auctioneer will agree with me. Do you want to hold it for one last time and say goodbye? I'm going to make you feel really guilty here! And that was Dad's and... Yeah, give it a kiss. Yeah, say goodbye. I'll take that from you now! Well, we'll find out how Nigel's model engine does later. But before that, David's examining a 19th-century pistol which has been brought in by John. -to stop that, I've got rid of the real ones and I'm now getting rid of the display ones as well. So shooting was a hobby of yours. -And were you a good shot? Don't be modest. No, I was never as good as I wanted to be. Right. OK, well, this obviously is a firearm from a different era. The first thing I would say is that it was made in the first 20 years of the 19th century. This is borne out by the fact it has a crown, and beneath that are the initials GR, George Rex. We can take it that it's late George III or early George IV, somewhere between 1810 and 1825, I would say. and what one did was to remove this part here. then you would push that home with this. Now, on a rifle, this would be called a ramrod. Do you call it a ramrod on a pistol? Er, yes, I think we would. OK. And then, when you've loaded it, you push this back. The next thing I think one would do would be to place a little bit of powder on the outside of the barrel. and Bob's your uncle, there's an explosion and the bullet comes out of the end. Now, you're a shooting man. Above 30 or 40 yards, you'd be lucky to hit anything. on that basis, but it would be something you'd use in almost hand-to-hand conflict, really. generally come down between £200 and £300, as I'm sure you know. You've got an idea of what it's worth. and sometimes a bit of chasing here, and they can make a lot more. But I think it's true to say that this is a fairly standard-issue piece. We need to discuss a reserve. I don't want to hold a pistol to your head, but I would suggest 180. -Just a little bit below 200. Well, let's hope it makes more. I mean, we can't really make them pay more than they're expecting to pay. -So we'll go with that. -And I look forward to seeing you on the day. to get over to the auction house and see how our valuations fare. Barry and Betty's collection of World War One memorabilia will be going under the hammer. his model engine to go to a good home. And finally, we're here to find out if there are any takers for John's 19th-century pistol. with auctioneer Gary Batt to get his opinion. It looks like you're in the firing line. In fact, I should do that. -I'm a bit happier now! Early 19th-century George III flintlock pistol in very, very good condition. Standard issue. We've got £200 to £300 on this. Well, we HAD £200 to £300. -That was the original estimate from your valuer. -The vendor has asked for a specific fixed reserve of £250. -So John's been on the phone to you. Yes. And I think that makes it a little more tentative, really, whether we sell it or not. I think at £200, you'd be very confident. At £250, it might just be a bit close. in which case the price would get automatically pushed up to 250, 270, 280. -I think this is going to go. I think it will sell. You've probably got your own opinion, but that's a bit of quality. That should sell. I hope that the fact John has put up the reserve won't put the bidders off buying this pistol. Still, I can understand he doesn't want to sell it for too little. First, though, it's time for me to feel nervous, as it's my valuation being put to the test. I love this next lot, obviously - it's one of my valuations! But it belongs to Nigel here, and it's that lovely meths-driven little live engine, which is great fun. And we've put a fixed reserve of £200 on this. -We're not giving this away. -I just hope we've got a few enthusiasts out here that like tinkering with things. -You need at least two, don't you? Two tinkerers. Here we go. This rather fun little working engine. All go. Lot 178. Who'll start me off with this, then? -For the mechanical amongst us. -We need a guy that loves tinkering. 100 is bid. And 10 I'll take. -Good, look. There's someone in the room who's keen. 140. 150. 150 bid. 160. 160. -Proper boys' thing, this, isn't it? No? At £200, then. Standing at the back at £200. Are we all done with this lot? -Done it! We've done it! -I am ever so happy. Nice thing to hold and talk about. It was, yes, and as I say, I thought when I came to the valuation about a hundred. and that's what it's all about, classic recycling. memorabilia, which is being auctioned by Matthew Denny. Lovely story. I think it was the story that fixated us on the day. -It was, Paul, it was. Why have you decided to sell these items now? -They're going to get lost. -And we've a daughter, and it's better that they go to someone who'll appreciate them. I suppose so. It's a boys' thing, really, isn't it? -but nevertheless I think Mark's right on the money. We've protected with a fixed reserve, because I just think this is such a wonderful story. Well, it's your personal history, as well, so you need to protect this. Good luck. Good luck, both of you. OK, this is it. We come to the death plaque for Fred Symes. Nice thing. Memorial plaque there and a collection of related ephemera and some trench art. Nice little lot, and I've got £60 to start. Do you want to take 70? -There's someone in the room. 110. 120. 130. 140. 150. No? 195 here. I'll take 200. At 195. 200, if you like. At 195 with me. 200 anywhere? No? With me at 195, then. -No. We just missed that one. By £5. We were short of £5, and the auctioneer didn't sell. Because we had a reserve of 200, didn't we? Well, they should have done. I mean, did you have a fixed reserve? We had a fixed reserve of 200, but I think they could have used a little bit of discretion on that. -you say a fixed reserve of £200, he's got to get you £200. If you say £200 with discretion, he can take it 10% down. He would lose £5 just to sell it at 195. -But you wouldn't mind getting 195? -Not a bit. Not a bit. Well, maybe they can find the underbidder. That's all I can say. And then hopefully we can sell it. But at the moment it stands as not sold. It would be a shame to take it home, cos it may get lost! Oh, that was so close to the reserve! for Barry and Betty to sell their collection to the nearest bidder, and everyone went home happy. It's time now for our final item of the day, as we test David's valuation of John's pistol. John, I've just heard from the auctioneer you've upped the reserve. -We're talking about that wonderful pistol, that George III military issue. We've got £200 to £300 on this with a fixed reserve of 180, but now it's gone up to 250. Why did you do that? that it might not have gone for a sensible price. OK. Fair enough. That's fair enough. I'm still a bit concerned, Paul. I think an extra £70 on my original estimate - we might just have priced it out of the market. so hopefully there was no need for you to do that. Tower flintlock pistol. This is a lovely thing. -Start you at £120, and I'll take 130. At £120. I'll take 130. Good, we've got a phone bidder. -Pleased to be proved wrong! I'll take 360, if you like. At £340. I'll take 360. On the telephone, then, at 340. 360, if you like, in the room. Yes! Top end and a little bit more! Well done. No need for raising the reserve. That's good. You've got to be happy with that. -That was quality. Good gun. I'm pleased. It's a good result. Well, that went with a bang! £340. What a fabulous result for John. I think he's going home very happy. Now, do you have any unloved antiques or collectables lurking at the bottom of a cupboard? to find out where we're planning to be for our next valuation days. Click F for Flog It and then follow the links to find the list of towns we're coming to very soon. As you can see, the auction is still going on, but at least everyone's gone home happy. That's the name of the game, and all credit to our experts. But there were a few close shaves there. That's not good for your nerves, is it? But that's what auctions are all about. So, until the next time, from Dorchester, it's goodbye. Presenter Paul Martin is joined by antique experts Mark Stacey and David Fletcher in the Dorset town of Dorchester. Mark examines some trench art from World War One, and David looks at a 19th-century pistol. Paul takes a break from the antiques and heads to the Portland Bill Lighthouse where he gets a personal tour by the last lighthouse keeper to serve there.